We like BIG changes, don't we? I love reading the stories of people who made big changes in their life, fitness and weight loss or otherwise. And doesn't anyone working on losing weight love to hop on the scale and drop into another range? If I see 161.5 one week and 160.5 the next, I might actually feel a sense of disappointment. But if I go from 160.5 to 159.5 you better believe there's a happy dance! Well, if you are on a long journey like me, there will be periods of time that there aren't big things to see. At least, not on a weekly basis. The scale may seem stuck (KEEP YOUR RECORDS - I know it seems tedious, but over time you can see the big changes you've made in small steps! Week by week it is almost invisible). You had a bad meal, a cheat weekend, a week where none of your meal planning seemed to come together and your nutrition wasn't where you wanted it. You missed a workout (or two). That's why this is a LIFESTYLE. You won't find me here promoting a diet or telling you NEVER to eat something, especially if you love it. I'm all about sustainability ... including in our daily lives. Last week I was in a bit of a funk. I found myself complaining through the first round of Cardio Fix. Snipping at my family. Wondering if my time was running out and I was going to fail soon. WHOA. Time for a mindset change. Instead of telling myself "I hate cardio, I hate cardio, I hate cardio" I started telling myself that I love doing something good for my heart. 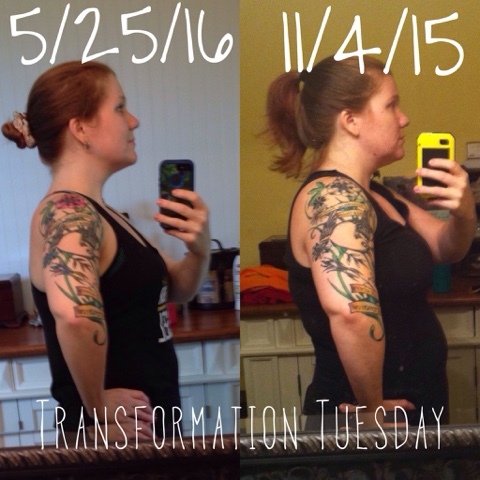 I started looking for progress from when I FIRST started doing 21 Day Fix. I used the step out the warm up. I run the whole time now. I used to do a lot of the floor exercises on my knees; but today most of them I am able to (by "giving it all I've got and a little bit more" that I didn't think I had) stay up the whole time. I'm not drinking diet soda. We don't have veggies rot in our fridge, because we EAT THEM. My closet is shrinking ... I keep giving away things when I go to put them on and discover they're too big. I consider it a "cheat" when I eat a roll at the local Italian place ... there was a time I probably wouldn't have wanted to even count how many I ate. When the going gets tough, don't look back at where you used to be. But look back at where you started and look at your progress. That didn't happen overnight, and the next big leap won't either. It is worth it. You are doing a great thing. Keep doing it! Autumn mentions on one of the Chisel workouts that 70% of people who start a fitness program quit. BUT NOT YOU. And not me. Focus on now, right now. YES make goals, but don't get so focused on them that you see nothing but failure. Yes, look at how far you've come, but don't let the past drag you down. Grab a drink of water and pat yourself on the back. You've got this ... it's just one little thing after another.